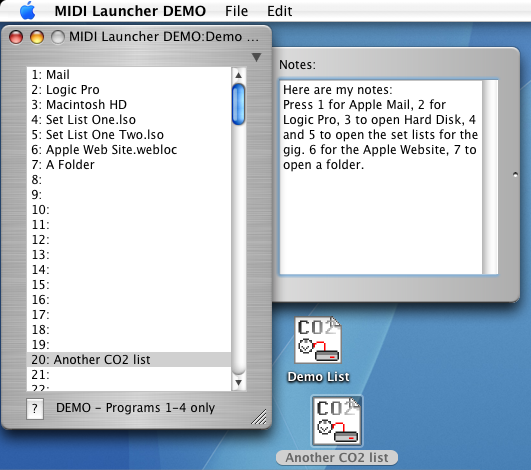 CO2 MIDI Launcher allows you to put applications, documents, folders, scripts and more under MIDI program change control. Use your MIDI controller to load songs for your music application, bring up lyrics, open folders, run AppleScripts and more! The program is simple and easy to use. Just a single list shows you your files and program changes. You can assign up to 128 program changes per document. In addition to the list, there is a pop out drawer in which you can store notes about your list. You can restrict incoming MIDI by channel and port so it’s possible to make only one MIDI controller be the master to launch documents and have another MIDI controller be the one that you play into a sequencer for example. As mentioned before, CO2 MIDI Launcher entries can be files, folders, applications, scripts and even other CO2 documents. So a program change could load another list into CO2 giving you even more options! If a file is not assigned to an entry in the list, the program change is ignored. So you can have the first 10 programs for example launch your applications and the second set of 10 play sounds, the third set of 10 launch other documents etc.. etc.. Simply select an entry in the list by clicking on it and then drag a file or folder onto the list. The dragged item will be placed in the selected slot. To add more items, simply repeat. To test your entry, simply double-click the entry in the list or send the corresponding MIDI program change number from your MIDI controller. You can make CO2 MIDI Launcher listen to specific channels and ports by making the appropriate selections in the Preferences window. By default, the program is set to listen to every controller and any channel. For the MIDI controllers that send program changes starting from zero, click the checkbox labeled Programs start from zero. If you need more info about your entry including the path to the document or when it was created, simply select the entry and choose Get Info ( command - i) from the File Menu. 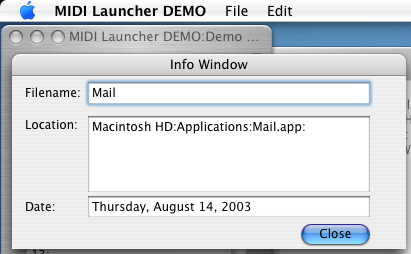 The filename, location and date will be displayed. DOWNLOAD the demo here . The demo only works with program changes 1-4 but you will be able to see how CO2 MIDI Launcher works and you can create documents that will work with the full version. PURCHASE CO2 MIDI Launcher ! Only $19.95! Upon payment Paypal will direct you to the download page. If you have any problems, contact me. If you have an iPod and play music, check out Intervalz. Use CO2 MIDI Launcher to launch and play MP3 files. Use one document to load another for more program change options! Launch lyrics for songs, launch AppleScripts to launch multiple items. If your MIDI setup changes (i.e. 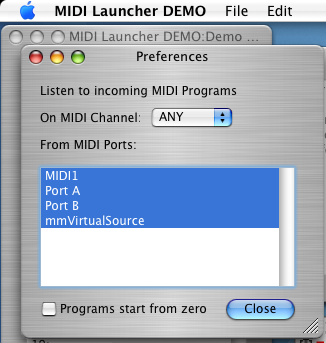 you add or remove MIDI interfaces etc...), the ports you have selected and saved may be invalid. When using documents created on another computer, revisit the port selections in the Preferences dialog. If CO2 MIDI Launcher cannot find a file (it has been deleted etc....), it will appear in the list prefixed with "!!! -" so you can identify the problematic file. If this happens, locate the missing file and select the entry and drag the file to the list or select the entry and hit the delete key if the file is no longer available.